Jeffrey Tucker found a unknown talent when he went from riding bikes as a hobby to jumping for the Rowan University men’s track team. Bike riding was something Tucker enjoyed doing in his younger years. He attended Eastern High School, a larger school in the Camden County area. He started loving track when he ditched the biking and started participating in the after school activity. All of his friends ran track, so he decided to try it. Tucker has not stopped his involvement in track since he started in high school. Eastern High School isn’t known for its track team. The school focuses more on its football team. The team always contends for the Group 4 state title. Over the years, the school has produced athletes such as Eli Apple, who starts at cornerback for the New York Giants, and Logan Ryan, a cornerback for the Patriots. With all the focus on football, the track team gets overlooked. Due to this fact, Tucker said that the team didn’t have as many resources or quality coaching. In addition to the coaching staff, Tucker faced another setback in his senior year when the football field was getting remodeled. This meant that he didn’t have a track to practice on. So he looked at the track meets as a way to get extra practice on an actual field. However, Tucker didn’t let poor coaching and a trackless school stop him from competing at a high level. He was twice a Group 4 champion in the high jump and received All-State honors. His biggest accomplishment was winning the state title for the high jump to end his high school career. After winning this prestigious award, Tucker fully realized his love for the sport of track. It was time to change this after school activity into a full-time sport. After high school, Tucker attended Rowan College of Gloucester County. This county college has seen success as of late, with the men’s track team winning the National Junior College Athletic Association National Championship in 2014. Tucker’s talent was recognized by the Rowan University men’s track staff and eventually he transferred to the university for the 2014-15 season. Tucker made an impact on the team right upon arrival. In his first year, he earned an All-American title with an eighth place finish in the NCAA Division III Championships and broke the school record in the high jump by clearing over seven feet. After pulling off such a feat, it could be easy to get complacent. However, Tucker uses his father as inspiration to always help him improve on his jumps. Tucker turned the after school activity into something he excels in and is passionate about. 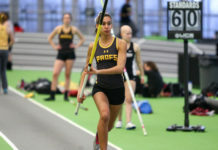 During last year’s indoor track season, the junior participated in the NCAA Division III Championships in the high jump. He finished first in the event and second in the long jump at the ECAC Championships, and won the high jump competition at the New Jersey Athletic Conference championships (NJAC). He will be looking to add to his impressive resume when the Profs compete at this years NJAC, ECAC and NCAA Championships.